Old moist wood in the smell. The first I pick up is just like being in an old dunnage warehouse. Then the fruity (dried fruits from Sherry influence) comes rushing in. Some dark berries as well, sweet vanilla and honey and just a dash of tobacco. The oak really does the trick in the taste after 30 years. Spices, tobacco and sweet marzipan oak. A long finish. Quite remarkable for a whisky that is watered all the way down to 43 %. The spices, tobacco and wood really shows off here in the finish. 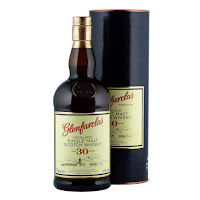 I would have thought the fruitiness were more present in an old Glenfarclas like this, but for me the tobacco, spices and wood dominates a bit too much. Not in a “bad quality” way, just in a “not quite my palate” kind of way. So if this is your flavors, go for it, because you will love it! I will rate this 89/100 (21/23/22/23).